The aviary mesh is the right solution to reduce damages caused by birds. The aviary mesh acts as a physical barrier to block the access of birds to protected areas. The aviary mesh is one of the most suitable methods for bird protection because it fulfills the job and it is harmless to birds. The aviary mesh helps to control the access of birds to inappropriate places. The interaction between birds and humans can be advantageous or disadvantageous. By mentioning some disadvantages for humans, we find how important birds become in relation to people´s health. In some occasions, damages people suffer because of birds have proved to be of great importance. These damages can evolve in severe diseases that can risk people’s health. This is due to possible pathogens some birds may carry. The aviary net like CHICKENMALLA Poultry Netting reduces damage that bird droppings cause in different structures. Another disadvantage with great impact is the loss they can cause in the agricultural sector. Free-living birds, as any other organism, choose areas where survival factors are found. Agricultural areas are great potential places to become the ecological niche of many birds. These areas provide water and food in addition to shelter that protect them from potential predators. When birds live near crops where they can have free access to food and where there are no measures taken to drive them away, this eventually becomes a serious problem difficult to put away because bird population increases becoming a plague. These pests consume the seeds or fruits of crops causing huge losses to farmers. When installing, the aviary mesh is easy to handle. The poultry netting is a harmless and functional method. With proper tools and equipment, the installation of the aviary mesh is practical and safe. To prevent health risks and losses that birds may cause to farmers, measures should to be taken to keep them away from places where they represent a menace. One of the methods to prevent the negative effects that birds may cause to humans is the barrier method of the aviary mesh. This aviary mesh blocks the access for birds to certain urban places or crops. 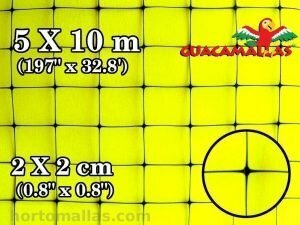 The bird mesh is suitable to provide protection to crops or different structures. The aviary mesh is an effective method compared to other bird protection methods, such as generating noise or reflecting methods because with time, birds get used to them to the point where they lose fear and ignore them, so these bird protection systems fail to fulfill their function. This aviary net mesh is bird-friendly compared to other methods that can harm birds or even risk their lives. Is this poultry netting comparable to the hexagonal chicken wire?? is it cheaper? ?